With Jah Kingdom, Monique Bedasse has written an insightful account of the Rastafari repatriation movement to Tanzania which links the story of 26 Rastafarians to the great political developments taking place on the African continent and its diaspora in the time after independence. Bedasse has woven a global history of diasporic networks across three continents (North America, Europe and Africa), while touching on the development of the pan-African movement as well as African nationalism. At the same time this book exemplifies the clash between expectations and realities of repatriation faced by Rastafarians in Tanzania as well as their ways of negotiating the terms of repatriation in a post-colonial world and building alliances within a South-South network. The Rastafarian movement has always seen “their source of identity construction […] in Africa” (p. 2) and the repatriation of Rastafarians from Jamaica (Babylon) to Africa (Zion) where they could set up Jah Kingdom (a kingdom of God) was always a defined purpose of the movement. Bedasse’s account of Rastafarian repatriates neglects commonly known pop cultural aspects of the Rastafarian movement and “emphasizes an interior history of Rastafari that sees its evolution from within” (p. 2). She therefore ties in with recent research on Rastafarian repatriation to Ethiopia by Giulia Bonacci and Erin MacLeod. There is a lack of research about Rastafarians in Tanzania; Bedasse closes this gap by introducing us to these Tanzanian repatriates led by Ras Bupe Karudi and Joshua Mkhululi and their wide network of pan-Africanists and black intellectuals. Jah Kingdom illustrates the “tension between Rastafari’s pan-African ideals and the realities of the nation-state” encompassing topics such as racial thought, citizenship, nationalism, socialism, diasporic networks and gender. Bedasse’s first two chapters are committed to the two main sites of this story: Jamaica and Tanzania, or what Rastafarians called Babylon and Zion. Chapter one introduces the reader to the origin of Rastafarianism in Jamaica beginning in the 1930s. While parts of this chapter might not be necessary for a studied historian of Rastafarian religion and culture it is indispensable to make this book accessible to a wide readership who will be grateful to the author for giving them an introduction into the ideas, terminology and background of Rastafarianism including the multiplicity of its religious ideology which goes far beyond the commonly known pop culture. Bedasse further discusses the role of different groups within the Rastafarian movement of which the Universal Rastafari Improvement Association (URIA) was most important as URIA’s base in the UK became an anchor point for the Rastafarian repatriation movement to Tanzania. The second chapter equally serves as an introduction to Tanzania’s early post-independence history and lays the foundation for a broader understanding of the political situation at the destined site of repatriation. Yet, it does so by mostly explaining it from the perspective of Rastafarians like Bupe Karudi and Joshua Mkhululi. Bedasse puts the role which Tanzania played in the pan-African movement into context with Rastafarians’ shift from perceiving Ethiopia as a Promised Land to seeking their repatriation plans in Tanzania. In chapter three Bedasse analyses the relevance of pan-Africanism and the black anti-colonial struggle in the relationships between Jamaica and Tanzania. She does so from two different perspectives: first, the close personal relationship between Jamaica’s prime minister, Michael Manly, and Tanzania’s president, Julius Nyerere, through their role in the pan-African movement and its effect on the diplomatic relationship between the two countries; second, the role Rastafarians played in construction images of Africa as motherland, or Zion, and the way public discourses about race and class were held and how Rastafarians subtly tied their own request for repatriation to Tanzania to Nyerere’s connections with Jamaica. Chapter four, one of the most intriguing chapters of this excellent book, shows the clash of the repatriates’ expectations of Zion with the realities of post-independent Tanzania when they were finally allowed to settle in 1985. While the general notion of socialist Tanzanian familyhood, ujamaa, was believed to conform to Rastafarian ideologies, this conformity did not always hold up in the practicality of everyday life. Rastafarians who in general rejected the idea of being a member of a nation-state, instead defining themselves as African, had to face the realities of the nation-state, when it came to practical issues like immigration. Bedasse shows how travelling from Jamaica to Tanzania Rastafarians struggled with the necessity of getting a Jamaican passport and applying for a visa to enter Tanzania, both of which contradicted Rastafarians’ claims on African identity. Yet, she equally explores the meaning of race as an identifier of solidarity and a means to legitimise the claims by Rastafarians like Mkhululi and Karudi to official right of entry, permanent residency and even land which was finally granted to them in 1989. In chapter five, the author engages with the mostly practical challenges Rastafarians faced when they repatriated to Tanzania. Facing issues like diseases and questions like how to make a living, their struggle to adapt to the local circumstances and survive in an after all foreign country turned out to be harder than some had expected. This chapter further depicts the strong diasporic network which stretched across Jamaica, Britain and Tanzania and was a key factor in the funding of the repatriation project. Bedasse further emphasises the role of women, like Kisembo Karudi, in making a living and establishing residence in Tanzania partly breaking out of Rastafarian gender norms. While chapter six ties in with the analysis of the Rastafarian network in chapter five, it focusses on an intellectual history based on the friendship between Ras Bupe Karudi and writer C. L. R. James, who supported the repatriation of Rastafarians to Tanzania. By reflecting on Karudi’s and James’ relationship, Bedasse discusses the mutual interests of Marxism and Rastafarian (the anti-colonial struggle) and its contradictions (religion in particular) and highlights their diverging attitudes towards European culture and western knowledge which Karudi completely rejected as foundation of an African education. This book benefits from a wide range of written and oral sources. Bedasse mostly used the testimonies and documents she received from Rastafarians while complementing them with archival material. This approach offers unique voices and a global perspective on the Rastafarian movement. Bedasse consequently uses Rastafarian languages to describe the experiences and politics of her actors. By introducing the term of a “trodding diaspora” the author aims at going beyond the boundaries of the nation-states and focusses on movement and the capabilities of Rastafarians to adapt (p. 3). Furthermore, Jah Kingdom offers an insight of women’s role in the movement by depicting the life of Ras Bupe Karudi and his wife Kisembo whose interviews are vital for this account. The gender aspect of this story reveals the ingrained patriarchal structures in the Rastafarian culture and at the same time shows the relevance of women in the movement. Yet, in this context, the author heavily relies on the testimony of Kisembo and her relationship with her husband to exemplify the challenges Rastafarian women had to face. The question remains as to what extent this individual story can be generalised for a whole movement. The overall structure of the book is logical and well thought through. Yet, chapter six falls slightly out of context and seems at many points out of place without any additional value for the overall work. While it certainly contains valuable material, this intellectual history might have been better placed in a separate journal article. Bedasse gives us an enlightening insight in still too rare research of South-South networks. 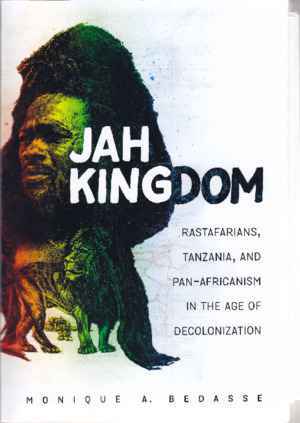 Jah Kingdom is an excellent analysis of how Rastafarians situated themselves in the eclectic interplay of pan-Africanism and Tanzanian nationalism and sheds more light on the global pan-African movement and the opportunities it created. Apart from the more evident readership who will have a background in Rastafarianism or post-independent Tanzania, this book will be of interest for any historian researching on questions of pan-Africanism, race and citizenship. Giulia Bonacci, Exodus! Heirs and Pioneers, Rastafari Return to Ethiopia, Kingston 2015; Erin MacLeod, Visions of Zion. Ethiopians and Rastafari in the Search for the Promised Land, New York 2014. Julia Held: Rezension zu: Bedasse, Monique A.: Jah Kingdom. Rastafarians, Tanzania, and Pan-Africanism in the Age of Decolonization. Chapel Hill 2017 , in: Connections. A Journal for Historians and Area Specialists, 29.03.2019, <www.connections.clio-online.net/publicationreview/id/rezbuecher-29025>.